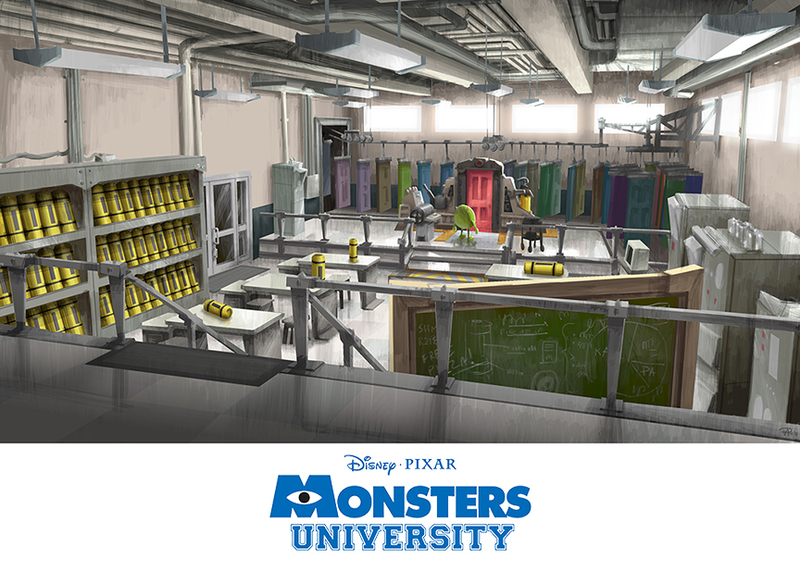 As a Pixar film nears its theatrical release, you can't help but feel the anticipation build as you chat about the new characters, watch the trailers and speculate over story lines. 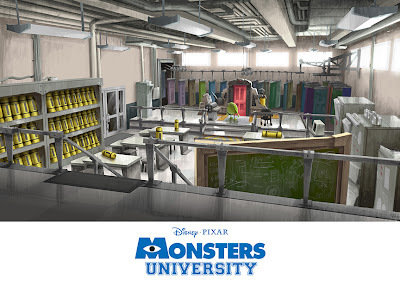 But the best part of a film's release as after the fact when Pixarians are able to share their work. 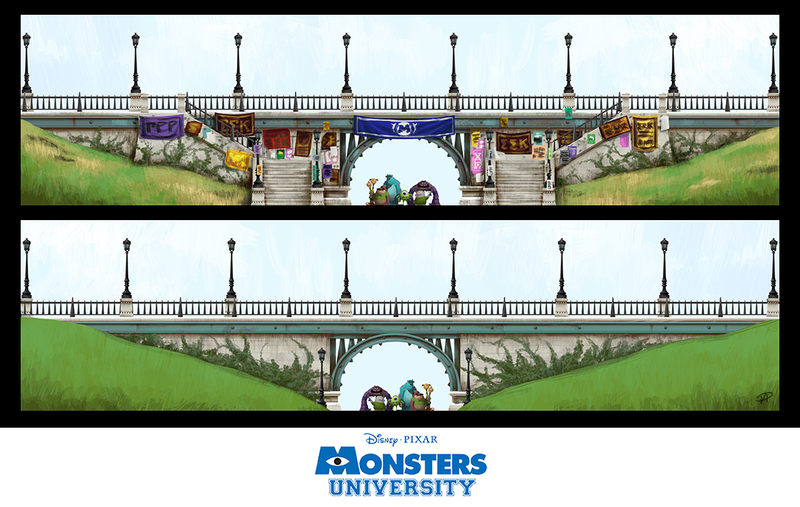 Over the last few weeks, we've been treated to some amazing concept art for The Blue Umbrella (from Paul Abadilla) as well as Monsters University (from Chris Sasaki and an animation progression). A few days ago, Pixarian Paul Abadilla, released another amazing group of sets and character artwork that he had the ability to work on - browse a few of them below and then head to Paul's personal site to view the rest. 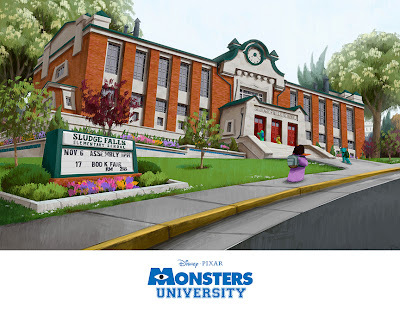 If you noticed a little something in the image above, you've got a great eye - this is actually from a scene that wasn't used in the movie and was more than likely the school that little Mike Wazowski attended. 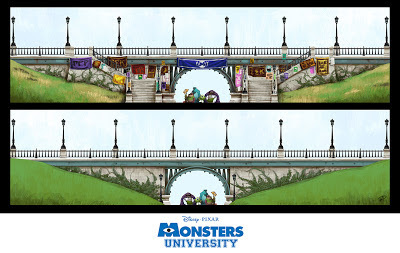 Additionally, a few of these sets were also created by Kristian Norelius and if you like his architectural, detailed style of art (as well as Paul's work), then you should pick up The Art of Monsters University as there is large section of his design work dedicated to when the Oozma Kappa gang visits Monsters, Incorporated.